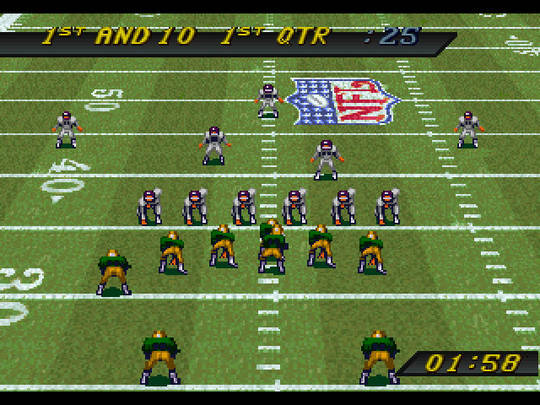 NFL Quarterback Club is a sports game that was originally released on the Nintendo Game Boy (1993). It features 28 NFL teams, the license of 19 top quarterbacks of the time and 430+ plays. There's also seven modes including Season, Playoffs (8 team tournament), and Simulation (placing you in various game situations). 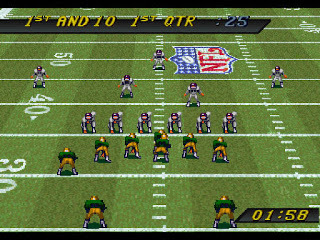 On Offense, it's not immediately apparent which plays are Pass or Run, so it's perhaps not as accommodating to newcomers as John Madden Football (1990, Mega Drive). However, the gameplay is smooth with responsive controls, and there's plenty of neat features such as the ability to see replays and switch between four camera angles. You can also preset your audibles, flip plays, and shift to a no-huddle offense, giving you full control over the action. There's tons of hilarious player celebrations too, and the voice-clips of the officials (e.g. when signaling a First Down) have good clarity. On Defense, providing you have a basic understanding of the different formations, choosing a play is a breeze. Executing your role in each play is simple too thanks to the fantastic controls and ability to switch between players in an instant. One annoyance though is that the game never remembers which player position you chose last; this is especially frustrating if you always want to be a Linebacker and constantly have to cycle through team-mates prior to each snap! The computer A.I. can be dumb too, such as calling unnecessary timeouts when they're ahead and about to punt the ball on 4th Down with less than a minute to go. Graphically, there's some cool scaling effects as you drive towards the endzone, but nothing that takes full advantage of the 32X. NFL Quarterback Club is clearly a Madden clone, but it does a commendable job of providing a solid game of American Football. There's not much innovation and newbies will likely have a slight learning curve on Offense, but it has a wealth of plays, content and modes to keep you playing for a long time. Random trivia: The game was also released on the Sega Game Gear, Sega Mega Drive and Super Nintendo in 1994.